Welcome to the 2019 Red Bird Express Season. This popular Special Bus Service provided by SCCTD served more than 100,000 passengers in 2018. You may post comments or questions here. Buses leave from: 134 St. Clair Square, Fairview Heights, Il, 62208, near the Water Tower. The first bus leaves 2 1/2 hours prior to game time with frequent service up to 40 minutes prior to first pitch. The Redbird Express will drop you off curbside at the corner of Clark and Broadway – a few steps from Gates 5 and 6. Return trips will originate on Clark Street between Broadway and 4th. If you are ONLY riding home with us but did not ride TO the game with us (perfectly acceptable and quite common), simply hand the SCCTD employee $5.00. Please note that there are numerous games with post-game extracurricular activities, and we CANNOT accommodate everybody who wants to stay for every event. Our last bus leaves Busch Stadium to return to St. Clair Square 45 minutes after the official end of the game. In the event of an early exit (rain delay, extra innings, heat-related, etc…), passengers always have the option to exit the stadium and board the bus to return. Buses will depart as soon as they have a near capacity load. All Fares are round trip only even when only riding one-way. No passes, tickets, or transfers accepted on Special Service. All Buses are wheelchair lift equipped and unload/load as close as possible to Busch Stadium (Gate 5 & 6). 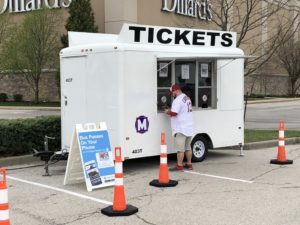 Tickets can be purchased onsite at the Metro ticket kiosk at St. Clair Square (cash only) or through the Token Transit mobile app. BUSES LEAVE FROM THE WATER TOWER AT ST. CLAIR SQUARE FREQUENTLY UP UNTIL 40 MINUTES BEFORE GAME TIME. All times are subject to change if game time changes. Check your local listing for any last-minute updates and changes.